Diabetic cats that stopped by to say hello! Diabetic cats that dropped by this website to say hello! A small selection of other diabetic cats that have stopped by this site and dropped me a line to tell me how they are coping with diabetes. Diagnosed diabetic in October 2011, this gorgeous girl is Rosie. This is Rosie's third favourite place to sleep, the first two being peoples' knees and peoples' beds!! Huge tabby cat Arnie was diagnosed as diabetic in November 2008. 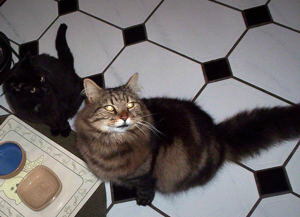 Here he is, patiently waiting for supper with his non-diabetic house-mate, Snoopy. Although Arnie lives up to his name in terms of size, his owner Mike tells me that Arnie is actually a big softie! However, Mike says Arnie does have his moments! 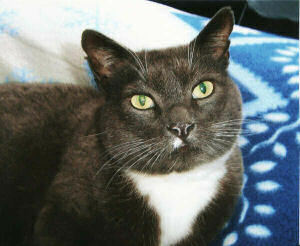 This handsome boy is Barnaby, or Barnie as his owner Amanda calls him. He's been diabetic for a couple of years now, and is doing well. He is completely black, except for about three stray white hairs on his chest Amanda tells me! Well done Georgie and Jimmy, it does get easier, I promise! This is Nudgie from Philadelphia in America. 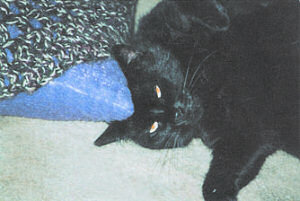 Nudgie was diagnosed in May 2007 and his owner, Bracey, says: “My cat Nudgie and I are new to the feline diabetic scene, but we’re both getting the hang of it, slowly but surely. Nudgie is the sweetest boy ever. Nudgie has twice daily insulin shots without a peep, although he does seem to thank me afterwards with a little cackle. It makes caring for him such a pleasure. 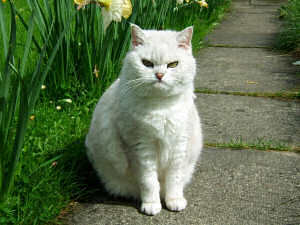 Nudgie is about nine years old and was the runt of the litter. 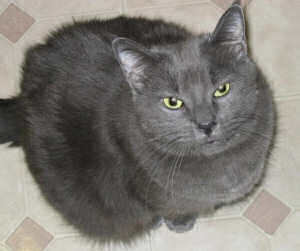 He was a tiny little gray fur ball; I just had to have him. Nudgie loves getting his picture taken (I call him my little furry supermodel), dancing, and playing on plastic grocery bags! 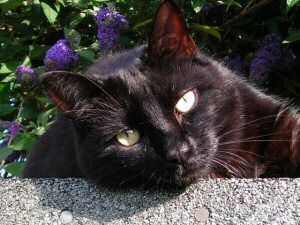 Diane in Leeds writes :“My cat phoebe was diagnosed with diabetes in January 2006. She already has a serious medical condition called mega colon and managing the two things at once can be very hard.We don't know how old phoebe is because we took her in as a stray in 2000. Recently we have had some upsetting times, fearing we were going to lose her. 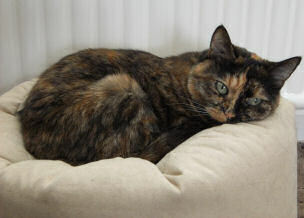 At one recent emergency visit to the vets her blood sugar was 0.6 mmol/l but amazingly she keeps pulling through. I must say our vets at Companion Care in Pudsey have been fantastic to us. Phoebe also stays with them when we go on holiday as we wouldn’t leave her with anyone else.